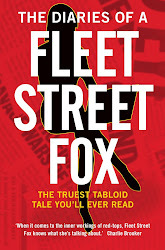 fleet street fox: Is that a fox in your pocket? HERE we go - the official phone app for fleetstreetfox.com! Whether you're a new visitor or a long-time fan you (hopefully) like to hear the insights of an anonymous tabloid reporter on everything from super-injunctions to the X Factor, as well as exactly which kind of train station-based foodstuffs are best for a hack on the go. Now for the first time I am at your beck and call, any hour of the day or night. It's very simple - download the app, ask Foxy a question, shake your phone, and she'll pour you a drink and tell you what she's thinking. If you've ever wondered 'What would Foxy do?' then this is the app for you. There'll be regular updates of Foxy sayings, and the home screen links back to this website if you click on the name at the side. I absolutely promise not to listen to any of your voicemails, but cannot be held in any way responsible for the results of you actually following my advice.